This candy is a lot like other brittles in that is it crunchy yet tender and buttery with a taste similar to toffee. To this one, add the flavor of roasty toasty coconut. Mmm mmm! 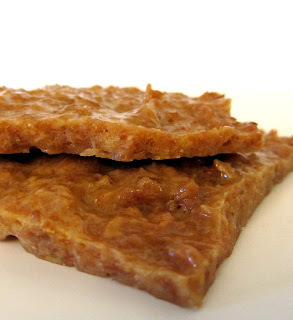 I did some research on coconut brittle before I began. There seem to be a lot of different ways to go about making it. Though I based the final recipe on the general knowledge I had gained, the inspiration and foundation came from The Ultimate Candy Book. This is a fairly simple recipe. You will need a thermometer that reaches 290°. 1/2 cup of chopped macadamia nuts stirred in with the vanilla at the end would be a great addition. Dipping the finished, cooled candy in melted chocolate wouldn't be half-bad either! 1. Get ready a large piece of parchment paper. Spray light with oil. Set aside. Get ready 1 tsp of vanilla extract and 1 tsp on baking soda. Set aside. 2. Combine the sugar, corn syrup, water, butter, and salt in a medium saucepan. Set the pan over medium-high heat. Bring the mixture to a boil, stirring often. 3. Reduce the heat to medium. Continue cooking, stirring occasionally, until the mixture reaches 260° (hard ball stage). 4. Stir in the coconut. Cook, stirring constantly, until the mixture reaches 290°. Remove the pan from the heat. Note: as the candy cooks, it has an almost overtoasted smell. Don't worry. As long as you can see that it isn't scorching, you're just fine. 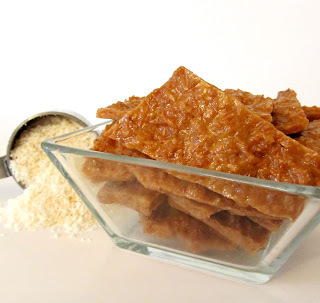 The candy will go from blonde, to golden, to a peanut-buttery color (like the photo). The cooled candy tastes perfect - not over toasty at all. 5. Stir in the vanilla extract. Stir in the baking soda. The mixture will foam up. 6. Immediately pour the mixture onto the prepared parchment paper. Very quickly and gently, spread the candy into an even layer, about 1/4" thick. 7. Let the candy cool completely. Break it into pieces. Serve! To store: cover and keep in a cool, dry place.